KawaiiPunk - Kawaii Mascot Blog: Onno Animation. Cartoon Capers! This is the work of Onno Animation. 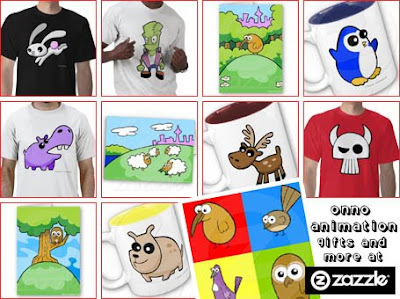 Onno Animation is an independent animation studio from New Zealand who, through their fantastic Zazzle shop, are creating some seriously cute and cool characters for us all to enjoy. Their selection of t-shirts, cards and gifts are just the ticket for the cartoon crazed among us, and let’s face it, that’s pretty much all of us! Enjoy!